International outlets vary widely, and travelers often learn the hard way that not all chargers are universal. Instead of lugging around extra cords and adapters, or simply going without essential devices, grab the Twist Plus+ World Charging Station at 33 percent off and travel with confidence, no matter where you are in the world. This pocket-sized, ultra-portable adapter is designed to charge your MacBook and four USB-compatible devices at the same time, in over 150 countries all over the world. Charge your laptop, smartphone, tablet, e-reader and more, all through a single outlet and without having to carry multiple chargers when you travel. Additionally, built-in fuse protection keeps your devices safe. Lastly, the adapter itself is surprisingly compact, measuring 3.41 inches on its longest edge, and weighing in at just 0.39 pounds. Toss the lightweight, compact charging station into your carry-on and never again get stuck with a dead device while you’re away from home. Get the Twist Plus+ World Charging Station now for just $34.99. Non-US readers can enjoy great savings as well on our world-adaptive charging station. Quality and design are matters of importance in a saturated market of portable batteries. The difference is clear in NomadPlus Smartphone Wall Charger & Battery Pack – smooth, attractive and powerful enough to provide support in any situation, particularly emergencies. Don’t replace your charger – improve it with NomadPlus, for $24.99 now at TNW Deals. NomadPlus fits with your existing Apple wall plug, allowing you to power up your phone with a cable as normal while charging up the internal 1800mAh backup battery. Indicator lights show internal battery level at the press of a button. 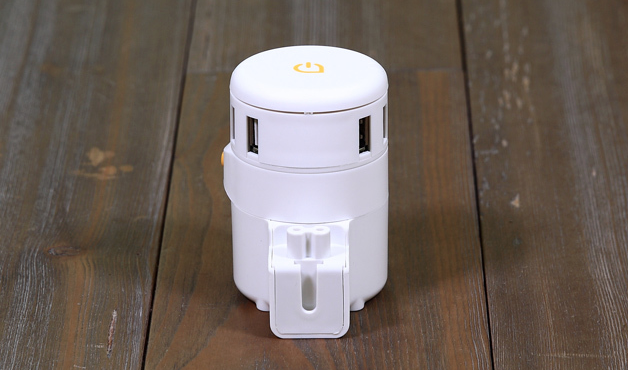 Unplug when ready, and NomadPlus goes from average wall charger to powerful portable battery. From the business trips to the bedroom wall, NomadPlus will keep you powered. Get it now for 37% off, a total of $24.99 on TNW Deals. While you’ve got efficiency upgrades in mind, the Titan Cable & Titan Loop Lightning Charger Bundle – now just $44.95 is a virtually indestructible duo to power your iOS devices. perfect for your on-the-go charging needs and compatible with all of Apple’s latest devices. Designed to be easy to carry around, it can be folded in half and attached to your keychain or bag. This keychain cable is long enough to extend to your power source, but short enough to fold in half and attach to your keychain or belt loop. Wrapped in industrial-strength steel, not only is the Titan Loop virtually indestructible, but essential for your on-the-go charging needs. Titan’s original 3.25 foot cable packs permanently-sealed USB and Lightning connectors as well for a one-two punch of charging convenience. One for home, one for the road, it’s a match made in heaven.